I wasn’t in the mood to be messed up. I put my head against my bedroom wall, closed my eyes, and whispered, “There’s no way.” It was late summer of 2003 when my world collided with what seemed like an impossible invitation from God: adopt two teen boys from war-torn Liberia. All the reasons why this wasn’t a good idea tumbled before me. Honest reasons. Understandable reasons. Solid reasons. Missionaries would be much more qualified. Missionaries with grown kids. People much more spiritual than me. People much more gentle and patient enough to do this sort of thing. Not this disorganized woman who originally thought Liberia was in South America. Not this mom who already felt overwhelmed with her three kids. How in heaven’s would we add two more? Not someone who paid so many late fees at the library they should have named a shelf after her. Maybe two. I can honestly say there were moments of sheer joy where I felt reassured I’d heard God right. But there were many other moments where life felt chaotic, messy, and really hard. There were tears. There were moments where I loved my five kids but I didn’t like them very much. There were moments I wondered if I’d heard God wrong. There was no way we could overcome a medical diagnosis one of my boys received. There was no way two teenage boys who tested at a kindergarten level could catch up in two years and be ready for middle school. There was no way I could be patient enough to educate them at home during those two years. 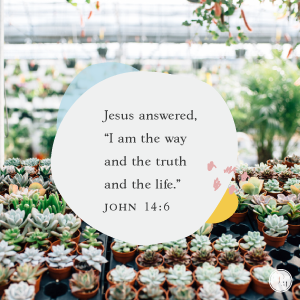 But every time I said, “There’s no way,” I’d remember Jesus calling Himself, “The way … “ (John 14:6). John tells us that Jesus is the way to salvation. Through Him we have access to the Holy Spirit (Ephesians 2:18) who gives us patience, guidance, and peace. All of which I needed. Desperately. Yes, Jesus was the One to follow. He was the One who would guide me each day. He was the One I needed to pour out my heart to in prayer. He was the One to listen to. And He was the One who reassured me with many promises in the Bible. I could be a light rising in the darkness. I could be full of life like a well-watered garden. I could be refreshing like a spring whose waters never fail. Me. Crazy, incapable, crying-in-my-closet me. If I let Jesus be my way and do what He was asking me to do, these things could be true for me. And they can be true for you as well. There might not be a way if you look at your situation with only human reasoning and calculation. But if you let Jesus’ truth and promises fill you, you’ll find a different way. A good way. A sure way. His way. Dear Lord, thank You for reminding me that You are the only true way. Help me to see this every day as the circumstances of life surround and sometimes overwhelm me. I desperately need Your help as I learn to say “yes” to Your calling on my life. In Jesus’ Name, Amen. Knowing the faithfulness of God helps us walk in faithful obedience to Him. That’s why we want to help women encounter the truth of God’s faithfulness through our free resources at Proverbs 31 Ministries like Encouragement for Today daily devotions, First 5 app, Online Bible Studies, radio broadcasts, and more. But we can’t do it without your help! Join our $70,000 matching challenge. For the next 48 hours, we’ll double the impact of your donation! Will you help us continue to walk alongside you and many others by making a donation to Proverbs 31 Ministries? Click here to give! And then there were 5…who all love you. What an amazing story of surrender to Jesus and how He takes those offerings and multiplies the blessings. It touched my heart and encourages me to say yes when Jesus asks for what seems the impossible. Thank you, Lysa. Bless you. Lisa thank you for faithfully serving the Lord as He has equipped you walking in obedience as He prompts. Your sincere Heart for Him and your willingness to remain transparent ministers to me and encourages me to stay the course and Trust in Jesus. God bless you. I am a native born Liberian and this testimony blesses me in many ways. Lysa, THANK YOU! You are the real deal, I love your raw-from the heart & gut-way of writing. Every time you write, I read your words and they penetrate me through and through. Your example begs me to follow. My flesh would choose easy street, but my spirit calls me to something greater. Messy as it may be. Thank you for sharing and confirming that our callings are not meant to be nice, tidy, nor easy-street but perhaps messy, bumpy, painful, and unplanned. xxxxoooo. Thank you for being willing to share your brokenness. We all feel so desperately incapable, incompetent and messy. It’s a relief to see other women admit it, especially when they’re women who seem like they’ve got it all together. Life with God is tough and messy and beautiful. Thank you for the reminder that it isn’t about me pulling myself up by my bootstraps but instead turning to the God who is BIG. Signed up for your letter for my wife. She passed away a little over a year ago. I had not been seeing your letter for several months then it started again. I thought about deleting it as it is addressed primarily to women. However, with my wife gone I was struggling to find a reason to go on. I was her caretaker for 2+ years. I had knee surgery 12/6/2017 (what a wimp) It was then that I began to understand how much stronger women are than men. She endured heart, both feet, pacemaker and failed pacemaker surgeries to name a few. Here faith shone through like a beacon! She ministered to friends, family and medical to her last. I am glad she is home with Jesus. Your letters have helped in my loneliness. Lord Bless & Strengthen You. Although God told you to adopt two teen boys from Liberia, it takes an obedient mind and a great heart to actually do it. God has never talked to me, but if He would have asked me to do that, I am not sure if I could do it. May God continue to bless you.